Producers Service Corporation is going over and above to protect their workers from silica dust exposure. Not only are they meeting the parameters set forth by the Occupational Safety and Health Administration (OSHA), but have almost completely eliminated all silica exposure on site. As OSHA just announced proposed rule changes regarding silica exposure, it should also be noted that industry has already taken proactive steps to address the issue. When OSHA issued an alert regarding silica dust exposure last year, many opponents of development used it as an opportunity (of course!) to explain why we should ban oil and gas development. They claimed the industry was not taking their employees health into consideration and putting them at risk, conveniently ignoring the fact that the research was done in direct collaboration with the industry. Meanwhile, Producers Service Corporation, an Ohio-based well service company, had already instituted a full respirator program, which includes training, fitting and providing respirators for their employees for many years. Recognizing that a full respirator program was only part of a solution, Producers Services Corporation also began using a wetting agent on their sand two years ago as a way to further eliminate silica dust during hydraulic fracturing operations. The wetting agent spray was a good solution, but not the final answer for Producers Service Corporation. Starting in 2013, Producers Service Corporation began using a KSW Environmental dust control system and configured it with their completion operations. What they found was a system that finally gave them the answers they were looking for to eliminate silica dust onsite. In addition to eliminating dust for their employees, they found dust control actually increased the life of their equipment. With such tremendous results from the silica dust removal system, Producers Service had the Ohio Bureau of Workers Compensation out to test the facility. It passed with flying colors. All of Producers Service Corporation’s customers who have seen the system in action have accepted it with open arms. 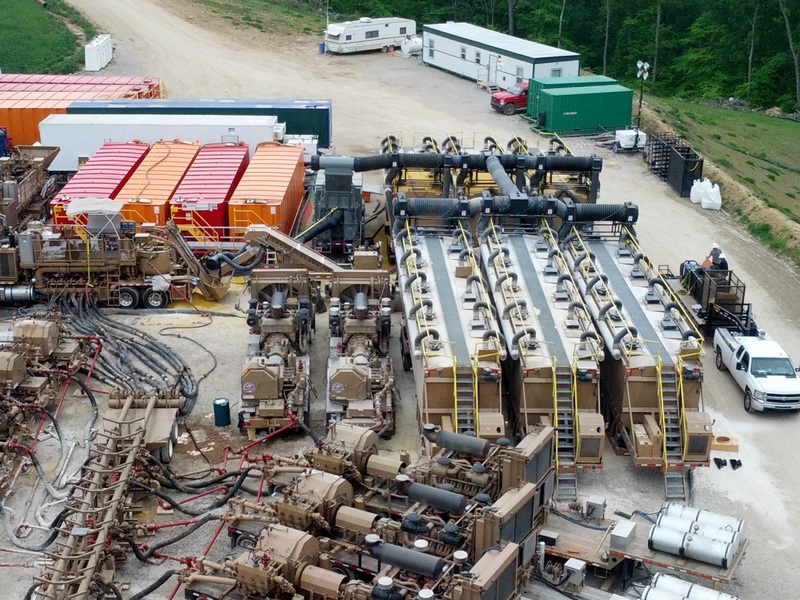 The new system protects workers during hydraulic fracturing, but also protects every contractor or employee on site who may be exposed to silica dust. The industry, just as in the past, is proactively addressing and eliminating risks to keep workers safe.